I am trying to ensure that the values of Size of Wales and of the Tipping Point are in the forefront of my mind whilst approaching my creative practice. This is taking shape in small ways, for example I have become a lot more aware of the materials I am using to create work. Particularly the mascot work we are doing, Bex and I have been very conscious of where it is we are sourcing the materials that we will use to make ‘Sow’ – ensuring that we buy material from charity shops or use what we already have to create the character. We are trying to ensure simple changes such as an awareness of the amount of paper we are using when presenting or developing ideas, using recycled papers when possible and doing our best to ensure no paper is wasted. The issue of waste has been important for us to consider throughout this process, again whilst creating the mascot we will try our best not to waste or throw away any materials that we do use. Being aware and conscious on how we approach our creative practice is allowing me to become a lot more responsible about how I am using materials. This is something that I will continue to carry through into my future practice as an art student. The process of working with a climate change charity, especially hand in hand with Malcolm Gladwell’s book ‘Tipping Point’, has been incredibly beneficial in helping me to recognise the importance of how our individual behaviours impact our environment. Our whole project has been focused on how creating a real shift in our sense of empathy and care for geographically distant communities will translate into behaviours that create a positive change and broaden how we see our responsibility being towards the planet as a whole and not just our immediate setting. However, it is important to remind ourselves as individuals working on these projects that our ideas are at risk of becoming quite hollow if we ourselves aren’t living out the values that we are hoping our proposed ideas will bring out in others. I have really been challenged by the positive work that Size of Wales is doing, it has brought to light in my mind many issues that I have not especially engaged with before. Particularly it has highlighted to me the importance of actually thinking about the products I am consuming and using, and considering the process they have gone through to reach me. It is so easy to overlook how our products are made and sourced, and often ignore the possibility that a large part of this process is damaging and unethical. The sources of many ingredients remain anonymous without investigation and so it is easy to turn off our minds to the damage we are actually encouraging through the purchasing of these products. Since beginning this project I have become a lot more aware of the responsibility I have to check that what I am consuming is not something that is damaging the environment. Reminding myself to actively consider the communities directly affected by environmentally damaging practice is beginning to shape the way I view my own behaviours. We need to widen our viewpoints if we are to expect positive changes to happen, it can become so easy to dismiss our own contribution to climate change, or fall into the thought pattern that, using the example of deforestation, because the damage isn’t being done directly in front of my eyes that it doesn’t matter. I can also recognise a need in myself to stop expecting that someone else will take responsibility for looking after our planet – and in fact remember we each individually need to see the importance of the changes we can make to help to sustain the environment. Today we had an in depth discussion with Anna about how mindfulness practice works as a long term way of actually producing positive change in the way your brain processes things. This was really helpful as it allowed us to see the actual beneficial application of mindfulness, and how this can carry through to a real and positive change in the habit patterns of the mind. It also allowed me personally to reflect on how these mindfulness session have actually been benefiting me and my approach to this project, and also how I might take the practice further to strengthen my own mental habits. 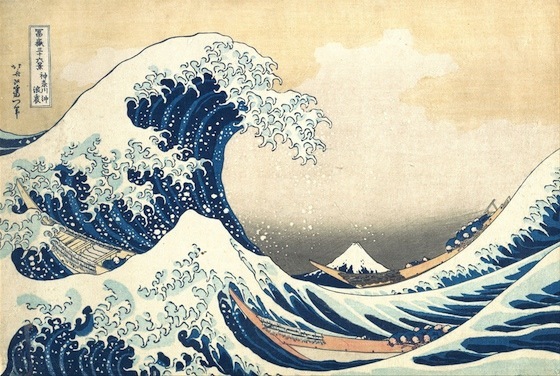 Katsushika Hokusai – Mount Fuji Seen Below a Wave at Kangawa. This painting freezes a moment in its present, the painting is serene and still – despite the fast moving, erratic and changing nature of the event depicted. We have explored how mindfulness allows for judgements to be removed, opening up our minds to experiencing what is happening presently, rather than allowing our preconceptions and subconscious database of stored experience to influence this acceptance of the present. Through the mindfulness sessions in this field project and also linking with my previous field project ‘Art and the Conscious mind’, which also included a session of mindfulness and a consideration of the relationship between the conscious and unconscious mind, I have really begun to appreciate how much power the subconscious mind can have over the way we experience things. Mindfulness has been a really fascinating exploration into how we can counteract this, and overthrow the amount of power the subconscious mind has over the way we behave, simply by becoming aware of the breath – and allowing ourselves to close down the connection between past experience and present. The positive impact that this practise can have on the way we treat others is also a very moving factor, and particularly important in this investigation into how we can sustain our world and one another. The ability to suspend judgements is no doubt something that can discourage our prejudices towards one another. So much of the hate in the world is formed from people acting on the misconceptions they have about others, if more people were able to recognise their own unfair judgements, and had the ability to suspend them, then it would have a really positive impact on the way that we communicate and work together as a global community. Mindfulness also offers us the opportunity to take a much more active role in the way that our brain works, allowing us to take more control over our emotions – and not allow them to take control over the way we deal with a situation. The constant changing of the brain (neuroplasticity) means that connections and networks of associations are continuously being created and grown. This can however have quite a negative impact on the way we think, and this is something that I have also experienced personally – and have tackled in the past through the practice of mindfulness and cognitive behaviour therapy (which I can recognise as similar to mindfulness in many ways, as this also acts as a way of breaking negative associations and encourages acceptance of present). Introducing mindfulness into the way you approach life is something that I can recognise as being really beneficial in the way that we sustain ourselves. In the example of anxiety, being able to take a more active role in the way we react to situations that would otherwise be anxiety inducing because of the negative associations attached, can help to sustain our health and wellbeing as we are not held captive by the overwhelming emotions that are out of our control. Our ability to handle and control our own emotions successfully will enable us to reach the goals that we need to reach with a lot more ease and clarity, and also allow us to support and help others a lot more successfully. I have felt that the mindfulness sessions that we are having alongside this project are really beneficial to my overall work ethic and self sustainability. The mindfulness sessions are allowing me to work with quite a clear and positive mindset, I have found it helpful to be able to set time aside to focus on simply the breath. It allows for any stresses relating to the project to dissipate. I have found it hard at times, particularly when I have a lot of things rushing round my head. But the guided nature of it does make it easier to learn how to switch these things off. I feel a lot more calmer and receptive following these mindfulness sessions. And have found that this has helped with the group work we have being doing. Feeling more receptive has enabled me to engage more with the ideas of others. Often with projects such as these, it can be easy to separate your own group off from others – and even within your own group, it can become tempting to push forward your own ideas without allowing any other influences to shape them. I don’t feel that this has been the case during this project. I feel personally, that throughout this project – with mindfulness playing a key part – I have been able to open up a lot more to the natural flow of ideas, how they interact with the ideas of others, and how this interaction begins to naturally form into a clearer and more finalised outcome. Having an open mind towards other ways of working, alternative ways of working e.g. working with more of a structure. Reminding myself not to cling so tightly onto ways that I am used to working, so that I may embrace new ways with a lot more enjoyment. Understanding how this allows me learn and grow as a working individual. Listening to the advice and concerns of the client, ensuring that our intentions are informed so that we are able to drive ideas forward with a lot more clarity. Openly acknowledging the strengths that other people have, encouraging them to use these strengths as part of the wider progression of ideas. Using our own strengths to support other people. Ensuring that we really do listen to each other, give each other our time, attention and engagement – making suggestions and encouraging other people as they share ideas. Allowing ourselves to explore and be more open to one another’s ideas enables us to feel valued and part of a constructive team. Taking time to talk to and get to know one another outside the timetabled discussions as well as within them. Equally sharing work load within teams. Open communication with the clients, ensuring that they feel involved and listened to throughout the process. Their concerns becoming our concerns. Our idea as a pair is aimed particularly at schoolchildren, we feel that this is such an important group to work with if we are to make positive changes for the future of our environment. If we are able to reach out to children that are beginning to explore and understand the world around them, and create positive changes in the way they see this world, then we can hope to see this lived out in a future of real difference. If we can help children to value and empathize with other cultures and help them to appreciate the beauty held in places across the world then real changes can be made. A generation growing up, valuing communities across the world, understanding how their behaviours have a global and personal impact is a generation that can work to sustain their planet.